When the Space Shuttle Buzzed New York City: How Did They Do That? Discovery Makes Its Final Voyage to D.C. Looking up is something New Yorkers rarely do. There's no better way to be thought a rube  or, worse, a tourist  than for someone to think you're craning your neck at the skyscrapers. But Friday morning New Yorkers made an exception, as the shuttle Enterprise buzzed the city on the back of a retrofitted 747, en route to permanent display at the Intrepid Sea, Air and Space Museum. 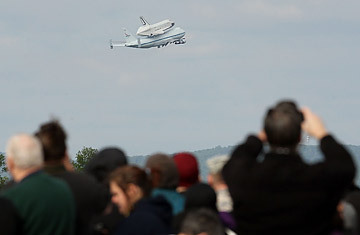 The residents of Washington, DC got a similar sky-show last week, when the shuttle Discovery came to town to settle into its new home at a Smithsonian annex in Chantilly, Va. In November, the shuttle Endeavour will arrive in Los Angeles the same sensational way, destined for the California Science Center. The twinned ships make a wonderfully cool sight, but they inevitably raise two questions: Just how do you pull a piggyback flight like that off, and isn't there a better way to do things? The answers are: carefully and no. For all of the millions of miles the shuttles have logged in space, they are not terribly mobile machines. They could never have gotten off the launch pad without a massive pair of solid rocket boosters giving them a push. Once they're in orbit they take a free ride on Newtonian physics. And for all the power and grace of a shuttle coming in for a landing, it's not so much flying as falling  its entire return from space conducted with no engine power at all. That's been a problem since the very first days of the shuttle program, when designers knew that once a ship had been built at the manufacturing plant in Palmdale, Calif., it would have to make its way somehow to the Kennedy Space Center in Florida (KSC) for launch. And while KSC had built its own landing strip for shuttles returning from space, bad weather might sometimes make it necessary for the ships to land at Edwards Air Force Base in California. That would mean another coast-to-coast trip for the inert 175,000 lb. (79,000 kg) flying machine. What was needed was another, even bigger flying machine to carry it around, and the obvious choice was the 747  sturdy enough for the job, powerful enough for the job and, best of all, a vehicle NASA wouldn't have to build from scratch. The first challenge designers faced when figuring out how a passenger jet could shuttle a shuttle was the unforgiving arithmetic of weight. A fully fueled 747 loaded with seats, passengers, crew, luggage, bathrooms, galleys and overhead bins tips the scales at about 800,000 lbs. (363,000 kg). Pop a shuttle on the top and you come perilously close to a full million pounds. That's bad news since a 747 can't leave the ground if it weights more than 833,000 lbs. (379,000 kg). Some of that problem solves itself, since you're hardly carrying a load of people on a shuttle ferry flight. But more weight has to be shed still, and the interior of NASA's 747s are thus stripped back to little but cockpit and raw fuselage. That gets the plane down to a nimble 490,000 lbs. (222,000 kg). Even with the shuttle attached, it can still make weight. Actually hoisting an orbiter onto the back of the aircraft is no small job either. For this, NASA uses what it unpoetically calls a mate-demate device, essentially an erector set of scaffolds and three cranes, each of which can lift about 100,000 lbs. (45,000 kg). Two of the cranes are attached to the shuttle's tail and one to its nose; it's then lifted off the ground and the 747 rolls in under it. The positioning has to be precise, because the hoists can do little more than, well, hoist. "The lift is actually the biggest challenge," said Casey Wood, an engineer who helps oversee the mating and demating. "With our lift we can only go directly up or directly down. It's strictly vertical; there's no lateral movement." Assuming the aim is true, the shuttle is then bolted to support struts attached to the 747. Finally, a tail cone is fitted over the engine bells to reduce turbulence and atmospheric drag. Only after everything is secure is the ungainly assembly of ships ready to be flown. NASA employs a team of 20 research pilots able to fly multiple types of aircraft, but just four of them are certified to handle shuttle transport flights. Accustomed to piloting an ordinary 747, which is built to travel high and fast, they have to readjust to going low and slow. Cruising altitude for most jumbo jets is about 35,000 ft. (11,000 m). With a shuttle on the back, the ceiling is limited to about 40% of that. Maximum cruise speed for commercial 747s is 570 mph (920 k/h). On a shuttle-ferrying flight it's about half as much. "That's the fastest we can go because things will start coming off," says NASA pilot Charlie Justiz, one of the four select fliers. To increase the safety margin further, a smaller reconnaissance jet flies 100 mi. (160 km) ahead of the 747, looking for rain, shearing winds and other dangers and helping to determine if a course change is necessary. When the shuttle-747 pair finally reaches its destination, the mate-demate process is run in reverse and the two ships are decoupled. For Discovery and Enterprise, the final leg of the journey into retirement will be even less dignified than their free ride aboard a momma 747. Endeavor will be loaded onto a vehicle normally used to move construction material and taken on a slow crawl through the L.A. streets until it reaches the science center. Enterprise will be transferred to a barge and carried up the Hudson River where the Intrepid, a retired aircraft carrier, is docked. Only the 747s will ever fly again  with at least one of them being repurposed for airborne infrared astronomy work. The shuttles, built for space, will ever after remain in place.